For the upcoming season, see 2019 World Rally Championship-2. The FIA World Rally Championship-2 or WRC-2 (formerly known as Super 2000 World Rally Championship or S-WRC), is a companion rally series to the World Rally Championship, and is driven on the same stages. WRC-2 is limited to production-based cars homologated under the Super 2000, N4, R5 rules. The series began in 2010 and split the Production World Rally Championship (P-WRC), which was previously open to both Super 2000 and Group N4 cars, into two separate competitions, both of which received their own FIA titles. There was also a World Rally Championship Cup for Teams within the S-WRC but this was discontiniued after 2010. From 2013, WRC-2 replaced S-WRC. The World Rally Championship-2 Pro class was created in 2018 and introduced in 2019 as a means of encouraging manufacturer-supported entries to join the category. The Pro class will be open to manufacturer entries competing in cars built to R5 specifications and teams permitted to enter two crews per event. Pro class entries must contest a minimum of eight rallies, including one outside Europe. Only the eight best results will contribute to the Pro class championship. 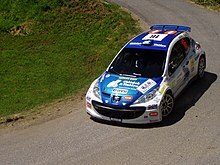 From 2010 to 2012(as S-WRC), there are 10 qualifying rallies for the new series, and at the time of registration entrants must nominate seven rallies, including two outside Europe, in which to score points. The S-WRC is in addition to the WRC Cup for S2000 Teams, which was announced earlier in the year. The S-WRC Teams cup was scrapped from 2011 onwards. From 2013 there is no fixed calendar. The teams can participate in any round of the season with the requirement that teams must contest at least seven events, with their best six results from the first seven events they enter being counted towards their final points tally. Updated after 2018 Rally Australia. ^ The Fiesta R5 is completely brand new model based on facelifted production model - Fiesta ST.
^ Although this car is built under the RRC rules, Prodrive still uses the S2000 label for this car. ^ Herrero, Daniel (13 October 2018). "Australia remains finale on 2019 WRC calendar". speedcafe.com. Speedcafe. Retrieved 13 October 2018. ^ Evans, David (6 December 2018). "FIA reveals more details of WRC support structure in 2019". autosport.com. Motorsport Network. Retrieved 6 December 2018. ^ Evans, David (31 May 2017). "Citroen starting from scratch with WRC2 car". autosport.com. Motorsport Network. Retrieved 3 June 2017. ^ Evans, David (17 May 2017). "Proton set for WRC return in 2018 with new Iriz R5". Autosport.com. Retrieved 28 January 2017. ^ Evans, David (24 April 2017). "Volkswagen Polo WRC to run with a privateer for first time". autosport.com. Motorsport Network. Retrieved 25 April 2017.